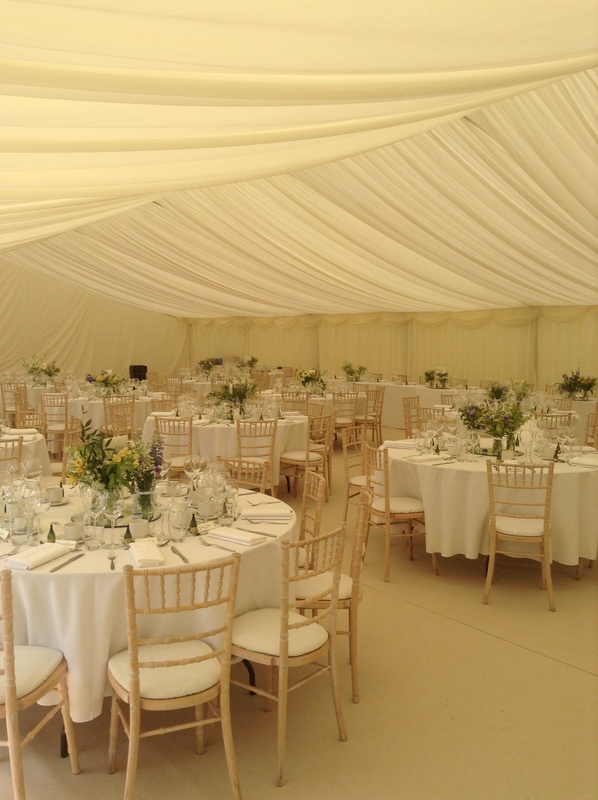 Saturday saw the KF team in Amersham at Rebecca & James wedding reception, held in a marquee in James’s parents stunning garden. Mum Jenny had spent hours tending to the garden and it certainly paid off, it was the perfect setting. 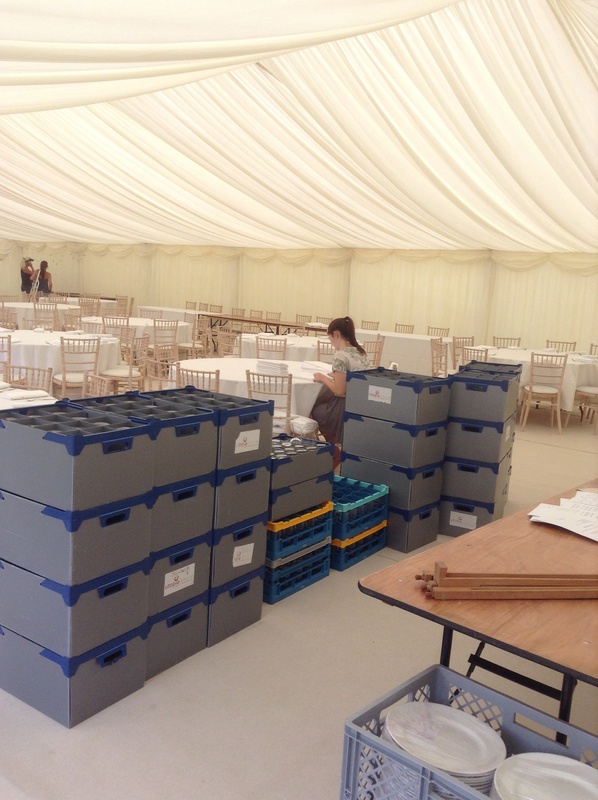 We arrived on Friday to an empty marquee, here are the girls starting the lay up with a blank canvass to work with, it always transforms from glasses being added and once the flowers are set. Saturday began with arrival drinks and canapés in the garden, the bride and groom looked stunning, arriving in an old Bentley, to greet their friends and family. The bridesmaids looked beautiful in navy with bouquets matching the flowers decorations in the marquee, every last detail had been thought about. 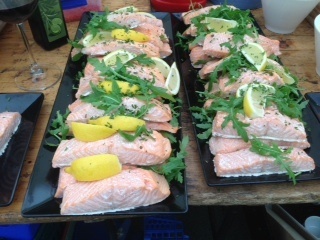 Speeches in the marquee followed by a buffet feast of Honey & Orange glazed ham, Broccoli & Blue cheese quiche, Poached Salmon a Fillets, lime Hollandaise and the couples favourite Coronation Chicken. This was accompanied by Greek Salad, Penne, roasted courgette, aubergine, red peppers, capers, salsa verde and Green beans, peas, rocket, sugar snaps, balsamic oil dressing with buttered new potatoes! Almost every table came back for seconds, some even thirds! This was followed by a KF speciality, a trio of desserts consisting if a Treacle tart, Eton mess and a Pimms, mint & Strawberry Trifle. one of our Jodie’s favourites! A delightful Jazz band played through the evening, the champagne kept flowing. Our wonderful Tom & Ian kept the bar stocked and pulled many a pint of real ale for the guests. A delightful family and another successful event for team KF, well done all! 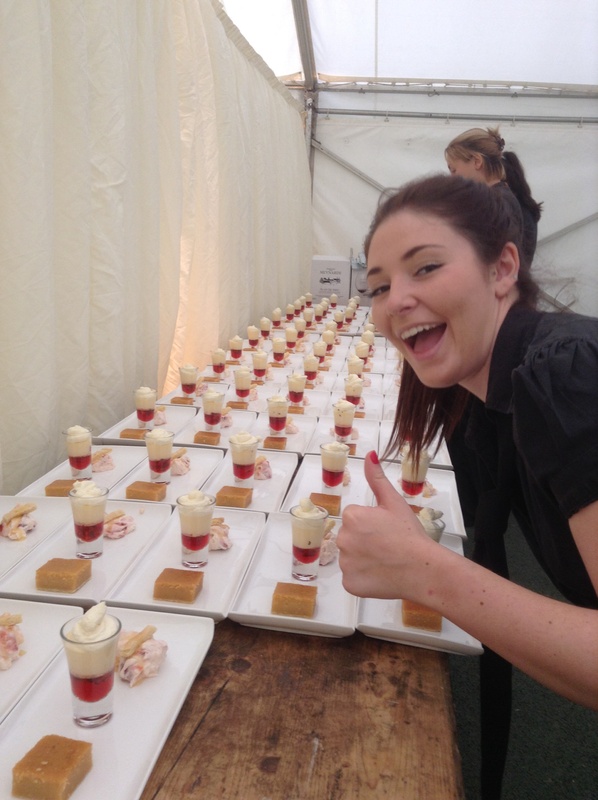 Saturday 19th will go down in Kingfisher history as being the hotest ever to day to cook and serve in a marquee! Three very different wedding this weekend for us but all of them professionally executed by the chefs and front of house teams despite everyone feeling like they’d had a fully clothed shower! At least the threatened thunder and lightning stayed away but it left us with soaring temperatures and humidity! It’s not an easy task with ovens and barbecues throwing out heat aswell! So well done everyone for keeping their cool! 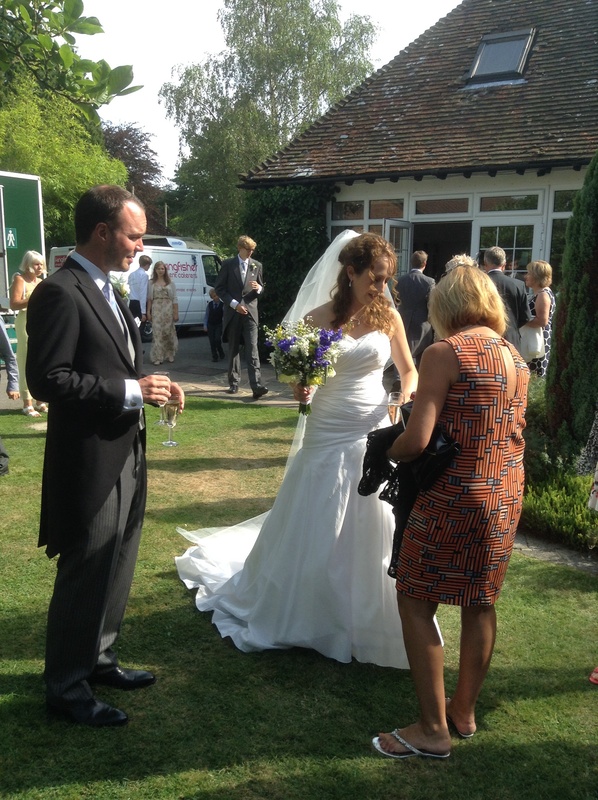 So I took off with John and the team to the lovely Sandridgebury Farm in St Albans for Sally & Andys wedding reception. Marquee overlooking beautiful countryside, such a picturesque spot. 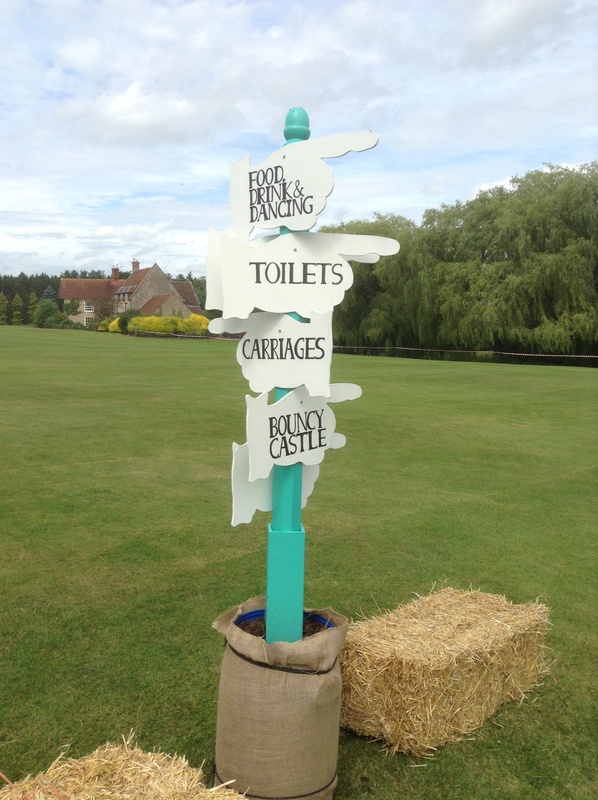 With Pimms and canapés on arrival, garden games and backing music, the setting was glorious. Even my staff seemed to be enjoying it! Speeches started the wedding breakfast and then they all tucked into Rump of Lamb, Colcannon Mash, Asparagus and baby carrots and mint hollandaise, delicious, the bridal party agreed with me, it’s the sauce that makes this dish! Well cooked John! This followed by a trio of desserts, Dark chocolate torte, orange shortbread, pistachio cream; Raspberry Brûlée, vanilla shortbread; lemon & ginger cheesecake, mint & raspberry Coulis. All washed down with ice cold wine and followed by tea, coffee & petit fours. 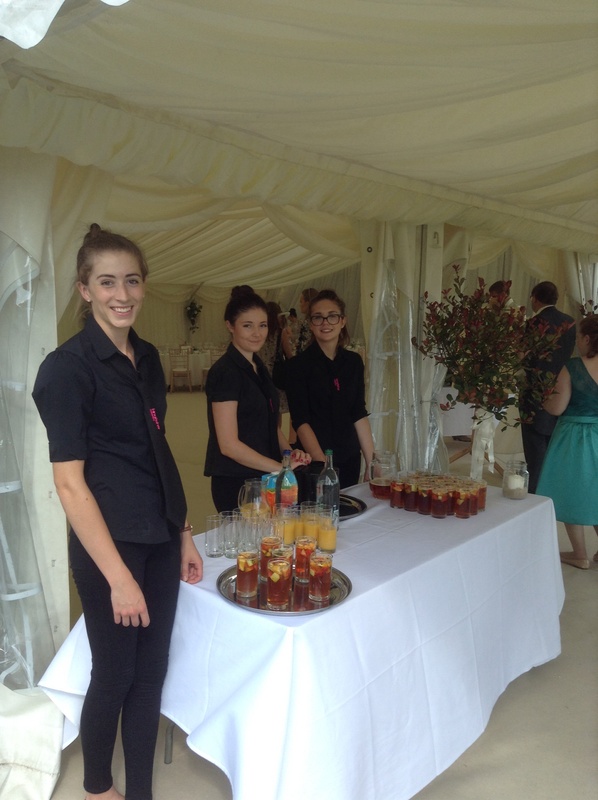 Lots & lots of evening guests arrived and danced the night away to a live band, Jodie, Amelia & Kate keep the drinks flowing from the bar with the help of our lovely chef John, who is becoming a bit of a legend behind the bar! Great day! Ian and his team looked after Craig and Lisa’s wedding set in Tipis at Lavender Farm in Hitchin. 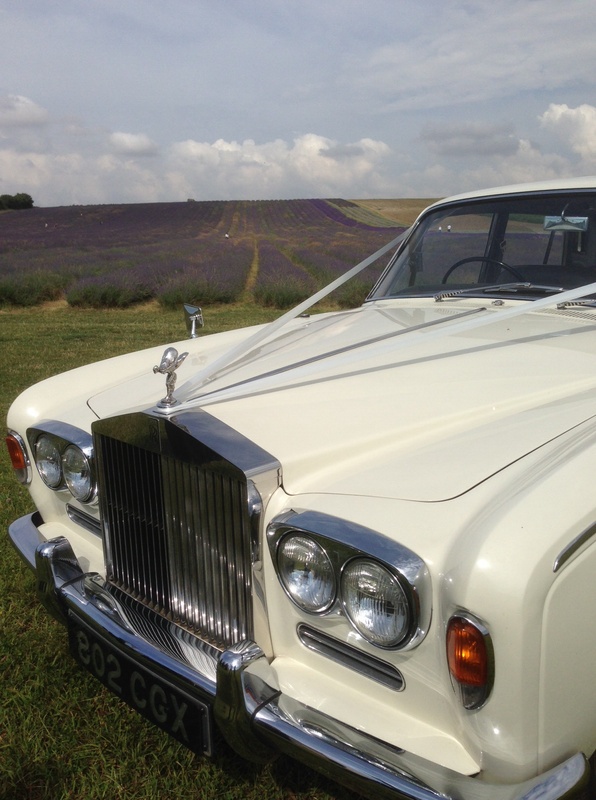 Bench style tables set with fresh Lavender set the scene, the bridal party arrived in two white Rolls Royces. Canapés and champagne on arrival, followed by a lovely meal exceptionally cooked by MJ and Stewart. 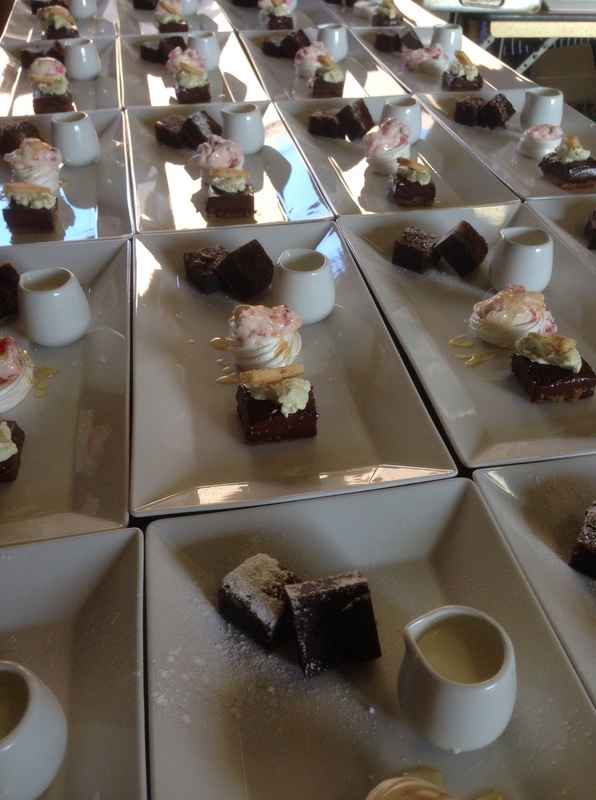 The Kingfisher signature trio of desserts was devoured Ian said! Evening food of Fish and chips, with disco dancing and cold beer from the bar made a memorable evening, for all apart from the guests drinking jager bombs, they may not of remembered to much this morning! Great time had by all! Team 3 went with a Dan & Seema to Chesham for Akexa & Ryan’s wedding celebrations! 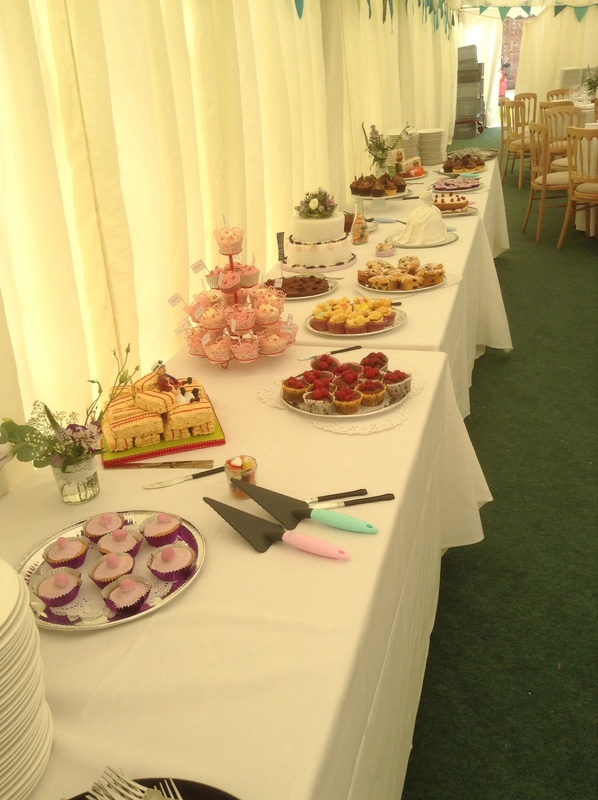 They had planned to have a very informal day with canapés and bowl food served to the guests in their parents garden. No particular seating plan was required, just a very relaxed style of service. Unfortunately due to the storm predictions they managed to secure the local church hall and moved everyone there instead, then in typical British fashion it didn’t rain a drop! Great day had by all though, they ate loads and partied hard into the night, with Tom expertly pouring and serving drinks from the bar the day flowed without a hitch! So another trio for team Kingfisher! Well done to everyone involved, we are making these exceptionally busy weekends a great success! Long may it continue! It’s the finishing touches that make the day! 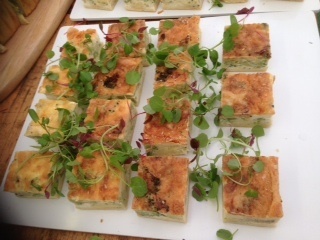 Another 3 events completed on Saturday with once again over 600 guests catered for, this is becoming a bit if a habit! A large Charity 3 course dinner at Edgegrove School in Radlett for Dan and the kitchen team, a wedding for me in Olney for 180 guests and another wedding for Ian and team in Chesham. 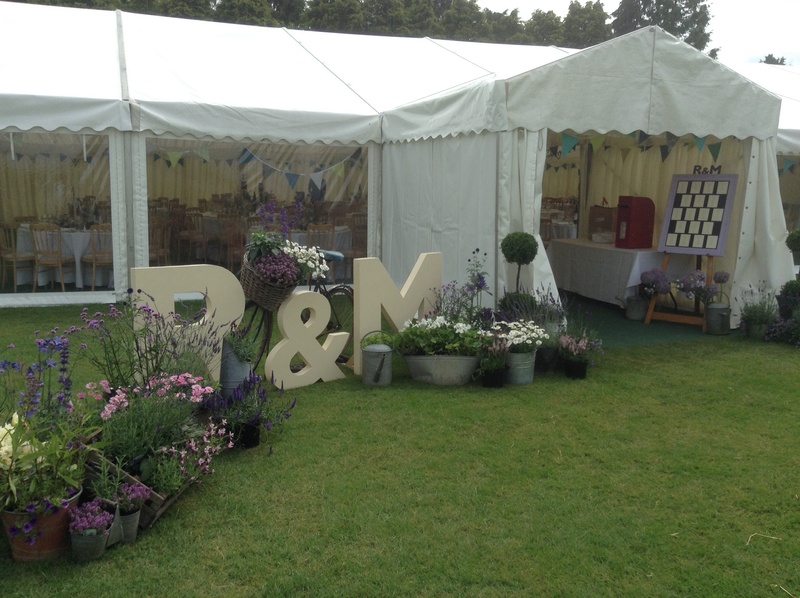 When I arrived in Olney on Saturday morning, I was blown away by the attention to detail Ros & Mike had applied to their marquee, from bunting & lighting, haybales to Lavendar & wild flowers to Alice in Wonderland style drinking vials, to signposts & postboxes! 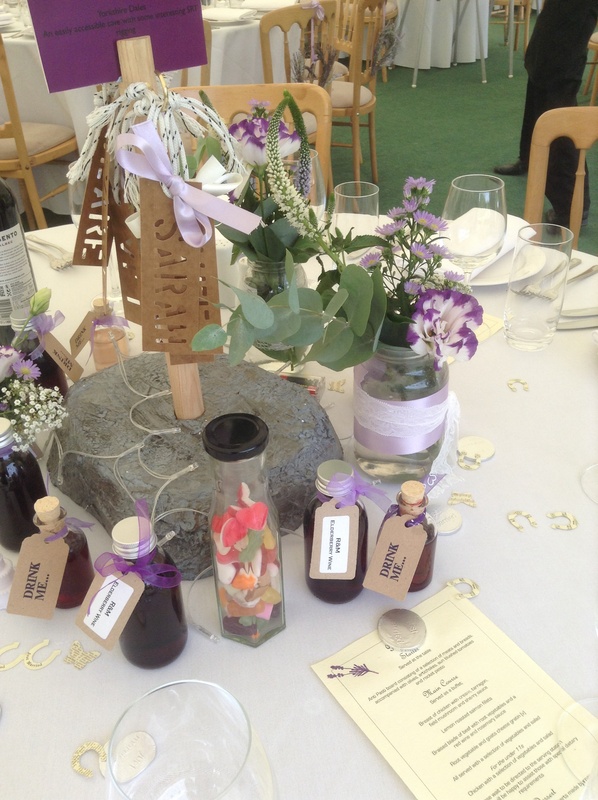 It looked every bit a country wedding set in the glorious surroundings of Snelsons Farm. They feasted on a buffet style menu of lemon Roasted Salmon Fillets, braised blade of beef, root vegetables, red wine & rosemary, breast of chicken, cream, tarragon, field mushrooms & sherry accompanied by Classic Caesar salad, buttered baby new potatoes and lemon & garlic green beans. This was followed by cakes made by friends and family and they then danced ceidligh in the warm summers evening! Beautiful couple, beautiful day! Ian and his team catered for Nick & Jess’s wedding in Amersham, they had stunning Tipis in the family garden where they said their own personally written vows to each other in front of family and friends under a beautifully decorated arch. 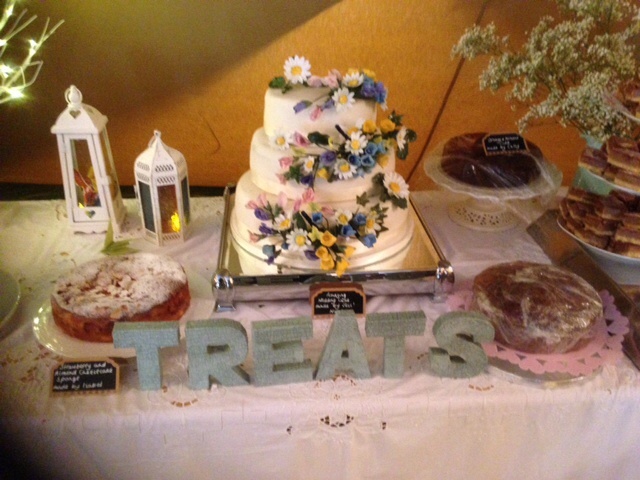 They then dined on hog roast and salads, homemade wedding cake and even an ice cream van visited to complete the meal. 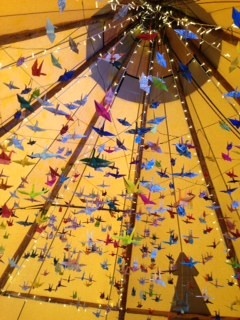 They decorated the Tipis with a 1000 origami cranes folded individually by the family which hung from the beams with fishing wire, the effect was stunning! 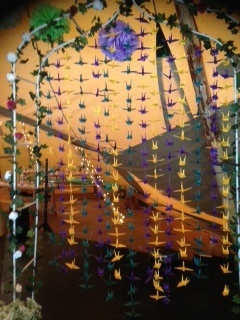 It is a Japanese legend, that promises to bring eternal good luck for the couple. It takes months and months to do, that’s dedication! MJ did Kingfisher proud by cooking up 100 portions of spicy chicken & vegetable noodle boxes from the family kitchen. The smells from the kitchen had peoples mouthwatering and the queue kept growing longer and longer! The band and following disco kept the guests dancing well into small hours. What a great day! Looking at the time both our couples spent planning and decorating their venues made both completely different but still both looking so unique and very special. The whole Kingfisher team worked very hard once again to carry through the commitment that had been months in the planning for our couples. Well done to all! Another successful weekend!